Porsche fans are some of the most exuberant auto enthusiasts in the world. With this is mind, how do you launch a new Porsche model in a way that lives up to the expectations of the enthusiast community? An Atlanta-based Porsche dealership and Audio Automation & Theater, Inc. (AAT), an Atlanta-based luxury AV integrator, unveiled the solution. 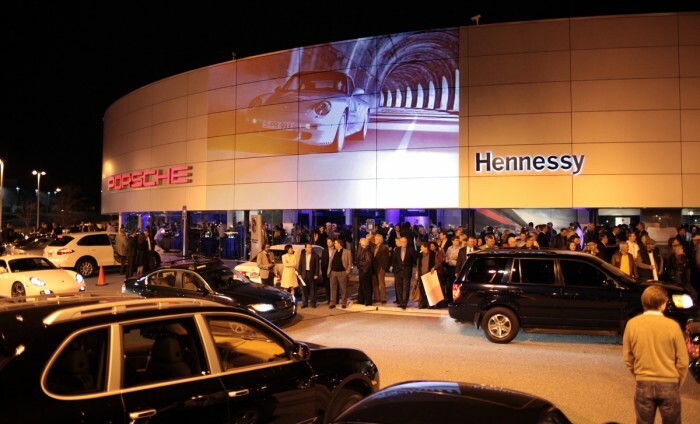 Using Digital Projection’s incredibly powerful TITAN Quad projector, 16,000 lumens of Porsche as Art imagery transformed the dealership’s front façade into a stunning visual display. For over 11 years, AAT has specialized in state of the art home entertainment. However, through their multi-faceted team and fervent love of the Porsche brand, AAT has taken on the audio and video duties for numerous Porsche product launches over the years. Recently, the launch of the newest Porsche 911 (known within Porsche as the 991) allowed AAT the opportunity to project a 572” x 270” spectacle onto the front of dealership as a welcoming beacon to the launch attendees. The 633” diagonal image included custom content created by the Porsche creative team, including test track footage of the new 991 in action, stock imagery and more. Serving as both the first and last impression made on the attendees, Kevin Collins, owner of AAT, knew that the imagery had to blow viewers away. This was a difficult proposition, however, as the projected image would have to contend with a large amount of direct and ambient exterior lighting. Furthermore, the projector would need to be rugged enough to withstand an outdoor installation with little protection from the elements. Collins had worked previously with the TITAN line, and settled deploying a single TITAN Quad for the event, due to its brightness, image quality and rugged design.